Fri, Oct 19, 2018, 07:32 pm SL Time, ColomboPage News Desk, Sri Lanka. 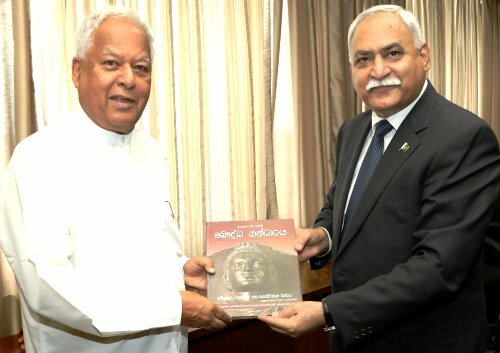 Oct 19, Colombo: High Commissioner of Pakistan, Dr. Shahid Ahmad Hashmat called on Minister for Science, Technology and Research, Dr. Sarath Amunugama at the Ministry recently. The High Commissioner apprised the Minister about the forthcoming visit of Commission on Science and Technology for Sustainable Development in the South (COMSATS)'s delegation to Sri Lanka. He affirmed that the visit will further enhance educational cooperation between the two countries. Dr. Shahid Hashmat informed the Minister about Pakistan-Sri Lanka Higher Education Cooperation Programme under which numerous scholarships are being provided to Sri Lankan youth in diverse fields. He also offered Pakistan's support to Sri Lanka in the field of technical education.